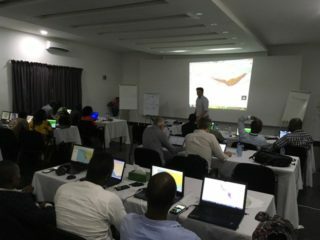 In May 2018, MEP delivered a week of Geographical information Systems (GIS) training in Sierra Leone. MEP’s Alex Senechal was accompanied by two members of the United Nations University – Fisheries Training Program to teach and develop key skills and best practice for the manipulation and visualisation of VSM data using R and QGIS software to the staff of the VMS centres in Sierra Leone, Liberia and Ghana. The week of training was seen by all in attendance to be a great success, with all participants requesting further training to be delivered in the near future, to continue to improve MCS in the region.